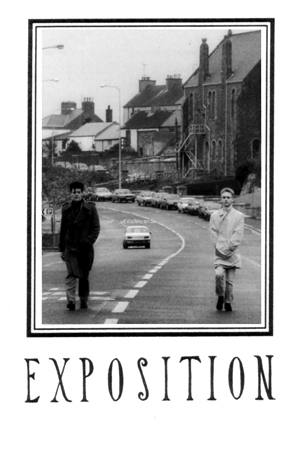 Following the October 1st EP, the album Exposition was recorded in Splash Studios again by only Neil Hannon and Lawrence Hoy. The tapes were then sold at various places: schools, record shops, etc. from Enniskillen to Belfast. A poster was also print to promote the album. The album was also sent to Hot Press for the Band Of '89 competition, and the band was selected. They performed songs from the album and finished 2nd to the competition. Unlike the recording of October 1st, the band did not use their Boss 220-A drum machine, but re-programmed a sampler available in the studio. The band left the studio with a copy of the recording on a DAT. Then they gave it to a tape mastering company who made the 300 cassette copies of the album. They also printed the artwork in a much better format than the October 1st but they couldn't print only 300 copies and had to order 600 copies of the sleeve. The title on the cassette was paint with a stencil by Lawrence. Most of them are grey, but a few copies have red painting instead. The photos from the sleeve were taken by David Graham at 8am on a Sunday morning to avoid traffic in Enniskillen.